My husband live on our sailboat (currently in El Salvador on our way to Panama), and during the rainy season we will be traveling across the USA and Canada in our travel trailer. We love to travel and explore new places. We're new to the RV life, so we're excited to meet new friends and visit new places. This is a nice park, 10 miles from West Yellowstone, albeit down a 3 mile bumpy paved road and a 2 mile dirt road. The sites are roomy and shaded. We opted for a site with electricity since we wouldn't be able to use our solar panels much. The mosquitoes are thick. It's a flat campground, dirt sites, with water spigots available, and vault toilets. We had a tiny bit of cell coverage. We weren't in camp much because we spent our days in Yellowstone, which is of course, awesome! We'd probably try for a closer campground on our next visit to Yellowstone, but this one was acceptable. We didn't spend any time at the lake which was nearby, and looked lovely. No dump sites nearby. We were told that Grizzly RV in West Yellowstone had one, we didn't check. We camped at Rainbow Point Campground (USFS) in a Travel Trailer. Shop for groceries when you're a couple hours away from West Yellowstone - they're very expensive in town. Start your adventures of the Park early to avoid traffic....and please don't stop in the roadways when you see wildlife!!! This is a small US Forest Service Park right along side highway 191. The sites on the river side of the highway would be best (sites 10-15), though I'm sure all the sites are affected by the loud highway noise during the day. The traffic did subside at night, but started again at daylight. The campsites are partly shady, not very level, and not very open, as the undergrowth is very thick. The interior road is paved and easy to navigate. We wouldn't stay again, due to the noise and nowhere to walk from the campground. We camped at Greek Creek Campground in a Travel Trailer. The Rambling Moose Campground was previously called the Virginia City RV Park. There are new and highly motivated owners who are very friendly, helpful, and full of plans to make this park exceptional. The rest rooms and free showers are spotless, there is a laundry facility available, and the WiFi was great. We were in spot 10, the last pull-through up the hill, so it was a small space and all the rigs made their turn around us, but it was okay for a couple nights. If we were going to stay longer I'd ask for one of the back-in spaces off to the side of the main road through the campground. The park is right next to the highway into town, but it's silent at night. We'd recommend this campground to anyone traveling in the area. It's a quick drive into Virginia City, and there are other places to explore nearby as well. A great spot. We camped at Rambling Moose Campground (formerly Virginia City RV Park) in a Travel Trailer. Enjoy Virginia City - lots to do there. Don't eat at The Hay Bale Saloon, but the beer is good! The Ghost Tour and the Follies are both worth the money. We were lucky to reserve a spot at the last minute in Fish Creek Campground. We had space B90 which was mostly shaded, but with enough sun to keep the solar panels working. Even with a full campground, it was generally quiet and we enjoyed our spot. We were gone most every day, but in the evenings it was pleasant. We used the free shuttles to avoid the traffic and parking issues, and it's definitely the way to go. We enjoyed the Ranger led hikes. The Rangers and the volunteers in the park were without exception, awesome. Can't say enough nice things about how this park is run. We camped at Fish Creek Campground (NPS Campground) in a Travel Trailer. Parking is difficult at the trailheads - easier to use the free shuttles! The Ranger led hikes are very informative. Beautiful park, with wide open sites and plenty of open areas. It was very windy each afternoon, but as long as you were prepared for it there wasn't any problem. We enjoyed the hiking trails and we especially enjoyed the the tour of the caverns. There isn't much shade in most of the sites in the park, but we just kept moving our chairs to stay in the shade of our single tree. The park hosts were very friendly and helpful. A lovely place! We camped at Lewis & Clark Caverns State Park in a Travel Trailer. Be sure to take the caverns tour. We did the "medium" tour, which has a fairly long uphill walk to the entrance, but it was well worth it. Be ready for wind gusts through the park at any time. After reading other comments about how roomy their sites were, I'm confused! We have a 19' trailer and just fit into our space (#13) which was actually just a wide spot in the road. It was listed as a 65' pull through, so we expected to have plenty of room, but the door to the rig was one step from the picnic table that was one step from the edge of the site where there is a line of high bushes, making it feel very closed in. The fire ring was two steps away but basically unusable since we were parked right next to it. We had reserved for 4 nights, but sadly decided to leave after two nights. There are no services, so the price is high in our opinion. It's a small campground with sites along one circular road, so the road was 2 feet from our rig where everyone has to drive in, then double back to exit. We wouldn't return even though the area is quite pretty and there is plenty of history to explore. There is a good store in Three Forks, and you can get free WIFI at the library. We camped at Missouri Headwaters State Park in a Travel Trailer. WIFI at the library in Three Forks. Bring your mosquito spray! Bozeman is about 30 miles with everything you could need. Great laundromat called The Clothesline in Bozeman. This is a nice park, but not up to Good Sam quality in our opinion. The pros - There are nice folks running the park, though they seem to be tired of it. There is a nice and inexpensive laundry facility. Easy access dump station and fresh water. When making reservations you have a choice between wooded sites, or in the meadow and full sun. Lovely view from the full sun spaces. It's about a hour drive to East Glacier via some gorgeous scenic roads. The cons - You can't choose a specific site. The site we were given was tiny, a sharp turn to back in, and barely long enough for our 19' trailer and truck. The advertised cell and WIFI service was intermittent at best and usually non-existent. We didn't mind having to go to the pavilion for service, but expected to actually get service while we were there! The bathrooms were fairly clean, but not spotless, and the shower stall was tiny! Every time I moved I hit the water faucets and nearly scalded myself. The mirrors in the bathroom were the funniest though. There was a set for people less than 5' tall, and a set for those over 6'...nothing in between. The power was at the front of the site so it of course wouldn't reach to the rig. We had to use a 110 to 30 amp extension cord. So, our overall rating is average - but we wouldn't recommend it or return. We camped at Glacier Meadow RV Park in a Travel Trailer. Beautiful park on the shore of Holland Lake, surrounded by forest and mountains. The camp hosts were so friendly and helpful, and worked harder than any camp hosts we've met. The park is well laid out, with plenty of room between sites. We're in a small trailer, but there were large rigs around. Dry camping, though there is a dump site on the way out, and fresh water to fill your tanks. Lots of mosquitoes so bring bug spray! 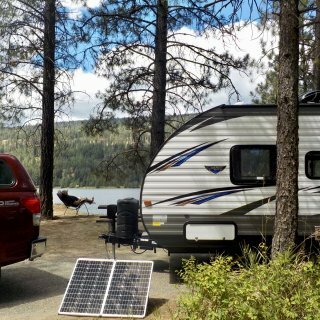 We camped at Flathead National Forest - Holland Lake Campground in a Travel Trailer. We stayed 3 nights in our 19' trailer. The sites were mostly occupied by tent campers as the road in and the sites themselves aren't great for larger rigs. We had site 006 which was just large enough for the trailer, and we parked our truck in the overflow lot. The bathrooms are spotless, and the showers are new and very clean as well; 25 cents for hot water. There is a small beach area, best for kids as it's shallow and somewhat muddy. All in all a very nice campground, but a bit tiny for RVs. Not enough sunlight for using our solar panels in our site. There is a sewer dump at the Bonner Fair Grounds in Sandpoint. We camped at Albeni Cove in a Travel Trailer. We shopped in Sandpoint which is about 30 minutes away. The owners of the park are very nice and very helpful. Dennis escorted us to our site and helped us get set up, and then provided plenty of information about the area and activities. We were in a pull-through site on the "top level", which is essentially a large gravel lot with about 6 or 7 pull through spaces right next to each other. Water, sewer, 30 and 50 amp is available at each space. There are a number of full-timers in the park. There is a nice breeze up the hill, so it was usually too windy for our awning, but in the afternoon the sun is behind the rig so you can sit outside. There is a small picnic table. We wouldn't stay here again, but only because of the location in the gravel lot, as it's not too scenic. There is a bit of a view across the lake to the hills above the Grand Coulee Dam. The area is very interesting and there is lots to do and see here. The Dam is a must visit, as it's truly a grand sight. 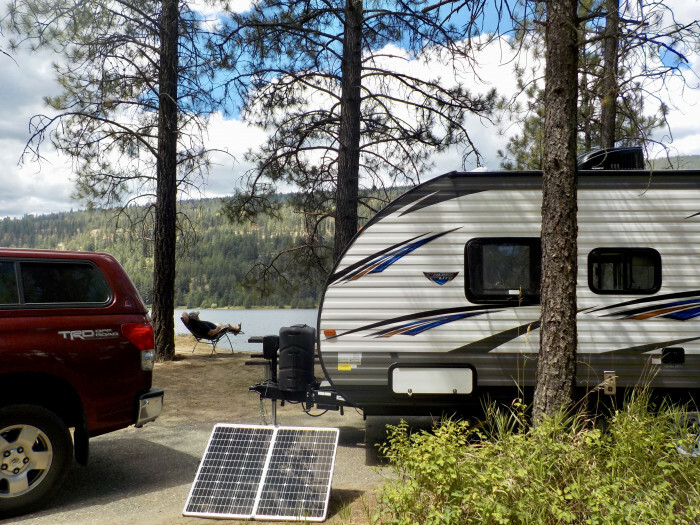 We camped at Grand Coulee RV Park in a Travel Trailer. This is a lovely campground along Icicle Creek. Mostly used by tent campers, but there is sufficient room for mid-size RVs. We were in site #3 which was just large enough for our truck and 18' trailer. It was very private, and very clean! There was a sign on the post with our name on it reflecting the reservation, and the site had even been raked. Large trees, so lots of shade, plenty of nice walks along the roaring creek. Very quiet except for the nice sound of rushing water. No cell or WIFI. The campground is about 10 miles from Leavenworth where you'll find anything you could need. 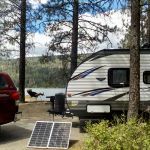 We camped at Eightmile Campground in a Travel Trailer. Leavenworth is a fun town to explore. Try the burgers at Fresh Burger! Walk up the creek, watch the rock climbers. This is a beautiful Washington State Park, set on the long beach north of the Columbia River jetty. The site we were camped in didn't have any services, but there were other sites in the park that did. There is a dump station on the way in/out. Our site was literally steps away from the beach, quiet, spacious and clean. There are many trails in the area and two lighthouses to visit. The Lewis and Clark interpretive center is an excellent attraction. We camped at Cape Disappointment State Park in a Motorhome. It's quite a long, windy drive into the park, so provision before you go. Once there, you won't want to leave anyway! This is an excellent park, with spotless facilities, new washers and dryers, friendly staff, and well maintained parking sites. The sites are full hookups with grassy areas between each. We stayed here for three nights while visiting family in Salem, so we didn't spend much time at the park. The park itself is a friendly oasis in a not so great area of Salem. It is near the fair grounds though, so there may be events there that are of interest. We would stay here again if visiting Salem. We camped at Phoenix RV Park in a Motorhome. This is another example of a great Oregon State Park. The sites are large with plenty of privacy, the facilities are clean, the paths are well maintained, and the location is spectacular. Dump station on the way in. The campground is set on a large spit away from the highway and on a long sandy beach. There are many walking and bike trails, and even horse rentals and trails. This is a very nice stop on highway 101. The nearby towns are cute with plenty of good restaurants and shops. We camped at Nehalem Bay State Park in a Motorhome. It's quite a ways back to town, so provision before you arrive!